What an unexpected turn of events at The Rec Room! On a night when planned to bring you Trivia Club in The Hall, planned shifted to the Three10 on the 11th hour! Don't worry though, you can still reserve your table for upcoming events and if The Hall is indeed available then the more reservations we have, then the better chance we have to take Trivia Club to the Big Stage! Make a reservation by giving us a call at 416-815-0086 or reserving through The Rec Room website. Don't forget to tell them you're there for 'TRIVIA'! 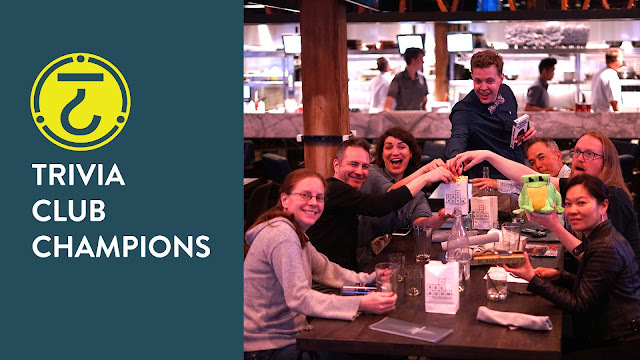 And if we're back at Three10... when we have a group of competitive teams like we had this past #TriviaTuesday, we'll have all the fun as the night comes down to the wire! N-Squared led the field after Trivia Classic , with Team Name returning for the second place spot after round one which saw the top two teams enjoying some swag! Just a point behind Team Name were Hey Google in third, while a point behind them were Sebastian Stan, joining us for a second time after debuting at Farside the month before! 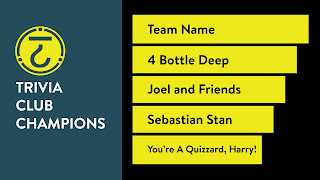 One point behind Stan were not one but three teams with twelve points, Joel and Friends, 4 Bottles Deep (in a civil war with their friends Hey Google), and You're A Quizzard, Harry! In eighth place, and just eight points off of the lead were Team Mix-Up to round out the crowd at The Rec Room! Tri-Pardo in The Roundhouse was round two, and that saw Sebastian Stan roll for ten points on the first question and lose ten points with an incorrect answer! Also losing ten were Team Mix-Up! Gaining ten points were Joel and Friends, N-Squared, and You're A Quizzard, Harry! Quizzard would also gain eleven points with the second question, which Team Name rolled for! Team Name would also grab those eleven points, while N-Squared lost eleven points and their lead along the way! Gaining seventeen points on the third question, rolled for Mix-Up, was every team save for Hey Google, and that meant that yes You're A Quizzard, Harry! hit for the triple and with a thirty-eight point jump, gained the lead on the field as well, going into the Finale! But with knowledge, gamesmanship, and luck on their side, winning their TWENTY-SIXTH GOLDEN VHS at Trivia Club, and becoming the first team to join the FIVE TIMERS CLUB at The Rec Room were TEAM NAME! They did not wager three of their points, but still won by three points! Well done Team Name, congrats again, and thank you to everyone who came out to compete and really leave it all up to an exciting mix of wisdom and chance! We'll see you all again NEXT TUESDAY for more Trivia Club at The Rec Room!